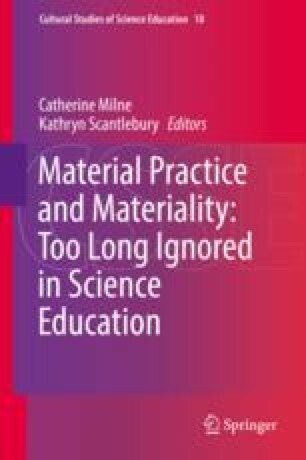 This chapter explores the nature of material practice from the perspective of technology, in particular the affordances for learning offered by the materiality of the Internet. A main focus of the chapter arises from the opportunities for teachers’ learning offered by video and associated tasks as part of web-based professional development. The symbolic representations of the Internet and human interaction with these materials have to be understood within social and historic contexts. On the one hand, the content of a particular website sets up conditions for how these content are displayed, viewed, and explored, but on the other hand, the content and use affect its being. A website sets up a range of possibilities, yet as interaction takes places, the range of these possibilities shifts. The materiality of a website is therefore both condition for and result of the actual use. Understanding this provides a theoretical perspective through which the process of learning through the participatory design of web-based materials can be understood. The rise of digital technology allows for symbolic multimedia representations where aspects of classroom practice can be presented and examined from different perspectives, something impossible in real classroom observation; and it allows collections of particular practice to be examined with ease. Research shows that video can be an effective tool in supporting teachers’ ability to notice significant elements of classroom practice and reflect on their own knowledge and beliefs. However, although video allows behavior to be observed, it does not allow the observer to see “behind” the lesson design. This means that the sociohistorical aspects of its production are hidden with the viewer lacking an understanding of the planning stages that the teacher goes through in order to realize the final lesson. Professional development programs designed around classroom video material need to reflect the complexity of working with groups of teachers who bring with them different contexts revealed through goals and values and personal perspectives, aspects which play a significant role in what is noticed and valued and how a website main be navigated. Our position is that the materiality of video as a tool for teacher learning can be best understood when embedded in a program with appropriate scaffolding informed by the concept of noticing, and in particular a web design that is founded on research into teacher learning in relation to the chosen context. We would like to thank the AstraZeneca ScienceTeachers’ Trust for funding this research and Jillian Trevethan for her contribution to the study.